If I am the author of an article or a book, do I need to request permission to re-use my own material in future publications? Can I post my material on a website? Do I need to contact the author or SLACK Incorporated for permission? Can I post a link on my Web site that links directly to an online article? 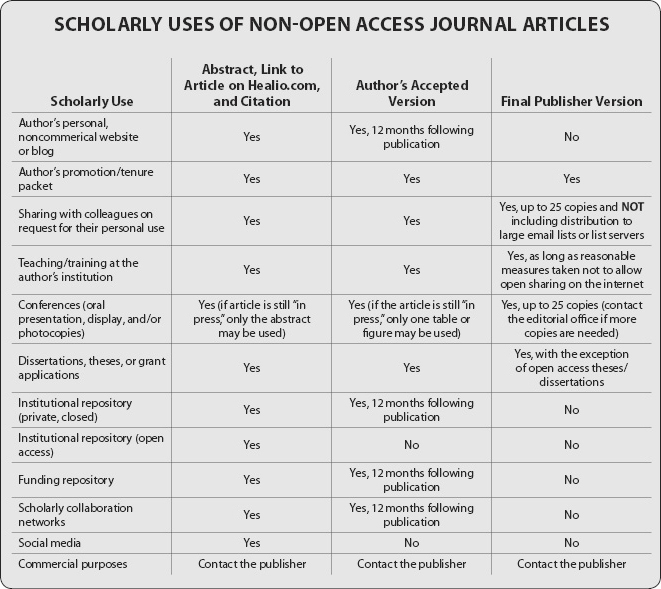 Can I post an entire SLACK Incorporated journal article, authored by me, in my institutional repository? What is the permission process? How do I submit a permission request to use material from SLACK Incorporated? If I have received permission once to use material, do I need permission subsequent times? Copyright is a form of protection grounded in the U.S. Constitution and granted by law for original works of authorship fixed in a tangible medium of expression. Copyright covers both published and unpublished works. SLACK Incorporated holds copyright on all text, tables, and images presented when a work has been submitted for review. Yes, authors must submit a permission request each time they plan on re-using their material. No, you may not post your material or the page proofs of your article on your Web site. However, if you obtain permission from SLACK Incorporated, you may post a link on your web site that takes you to the homepage of the periodical in which your article appeared. Click HERE to fill out our online submission form. You must request permission whenever you want to use any of SLACK Incorporated's materials, whether for commercial or educational purposes. Authors do not retain copyright on their manuscripts. Permission to use material published in a SLACK Incorporated book or periodical can only be granted directly from SLACK Incorporated. Can I post a link on my Web site that links directly to your website? Yes, you may post a link directly to the homepage or article pages of any Web sites owned by SLACK Incorporated. 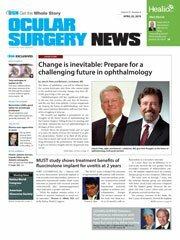 (Example: For OCULAR SURGERY NEWS you may post the link www.healio.com/ophthalmology). You may not post the article on your Web site; when you post a SLACK article online, you are violating our rights of copyright. Abstracts of articles can be used without submitting a permission request. However, for anything other than an abstract, please submit a permissions request. To request permission, click on the link that says “Request Permission” on the page where the content resides (you will be directed to the Copyright Clearance Center’s Republication service), OR click on the “Permissions” link at the bottom of any Healio website page to complete the online form. The Republication service will generate an immediate response and payment is made at that site. For the online form through SLACK Incorporated, we will respond to your request explaining the conditions of use for the requested material and outlining potential payment information. You are required to accept these terms and return our correspondence with the potential payment. If no payment is required, you must still accept the terms and acknowledge our correspondence. If payment is required, you will be asked to acknowledge the terms and return correspondence with payment, which can be made via credit card or check. Please keep a copy of the form for your records. Checks must be drawn on a United States bank in United States dollars. Make checks payable to SLACK Incorporated, 6900 Grove Rd, Thorofare, NJ 08086, USA. We accept AmEx, Visa, or MC. Payment is non-refundable. Please keep a copy of the terms for your records. You will receive an immediate response through the Republication service. For the online form at the Healio website, a permission request containing detailed information will be processed in approximately 7-10 business days. To request permission, click on the link that says “Request Permission” on the page where the content resides (you will be directed to the Copyright Clearance Center’s Republication service). Alternatively, for Journals and Periodicals ~ Click HERE to fill out our online submission form. If you have any questions, please contact us through any of the following resources: mail to: SLACK Incorporated, ATTN: Publishing Permissions, 6900 Grove Rd., Thorofare, NJ 08086; e-mail: publishingpermissions@slackinc.com. For Books ~ Click HERE to fill out our online submission form. If you have any questions, please contact us through any of the following resources: mail to: SLACK Incorporated, ATTN: Books Permissions, 6900 Grove Rd., Thorofare, NJ 08086; e-mail: bookspermissions@slackinc.com. Yes, all permission requests are for one-time use only. With each additional use, you must contact SLACK Incorporated.